What is the future for The Car? – HubNut – celebrating the average! What is the future for The Car? We could now be at a time where the dominance of petrol and diesel could end. Electric car sales in the UK were up an astonishing 148% in September 2014 compared to the previous September – the actual numbers are still pretty low, but it’s impressive. Not as impressive as the plug-in hybrid sales though – they rose an incredible 1101% (yes, eleven hundred and one) year-on-year. Ok, so we’re still talking only 4303 plug-in hybrids sold in September 2014, but it’s still a huge shift. With the first Hydrogen-powered cars now taking to the road as well, it’ll be very interesting to see what happens next. Hybrid sales are largely being driven by claimed economy improvements and tax benefits – both Vehicle Excise Duty or road tax and company car tax. On paper, they make a lot of sense. Some hybrids have a petrol engine with electric power boost, others like Vauxhall’s Ampera purely use the engine as a generator. The really clever ones, like Mitsubishi’s increasingly-popular PH-EV have an engine that can do both. It can either disconnect from the roadwheels to act as a generator, or active a clutch so it can provide driven power too. It has to be said though, hybrids work best when you can plug them in. Not all of them have this functionality. Every form of propulsion has its issues though. Petrol and diesel are running out, yet fuel prices are actually reducing as demand drops – are the effects of hybrids and electric being felt already? Pure electric cars still have range concerns and pose a lot of problems for the government. There’s no VED (it’s free) and as you can charge one at home, there’s a loss of fuel tax too. Even worse, it’s possible to charge electric cars for free in a lot of places. This must surely end – it could be a nasty shock for the EV crowd. Hydrogen has a lot of potential answers. It’d be easy to tax, as you’re unlikely to be generating it at home. The production of it is problematic, but it could be an ideal use for renewable energy. Use it to create hydrogen at times of high wind for instance, then store it when the wind drops. It’ll cost lots to create the necessary infrastructure, but it’s hardly beyond possibility. The cars themselves can do 300-400 miles on a fill-up apparently, and emit only water as tailpipe emissions. These are EVs without the woes of range. 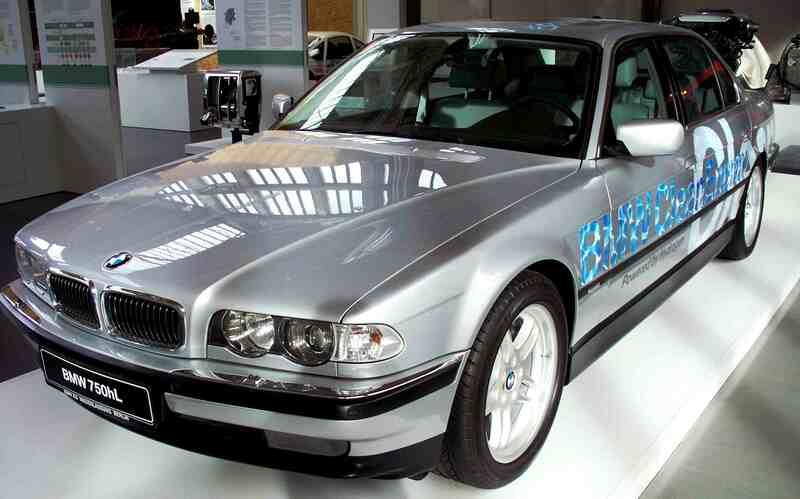 Not that they have to be EVs – BMW has been experimenting for years with a petrol engine that can also burn hydrogen. I’m pretty sure they had an E38 7-Series burning the stuff that was featured on Tomorrow’s World. For several years they have claimed to finally have the technology ready with the current Hydrogen 7, but cars are still not actually on sale. Tailpipe emissions are still hugely better than petrol or diesel. These are certainly very exciting times indeed as it’s not clear at this stage which form of transport will become king. The benefit to me is that I can’t afford a new car, so by the time technology filters down to me, a winner should have been chosen. The major downside is that until new technology becomes more affordable, I’m stuck burning fossil fuels with no idea what the future holds. Will I be able to even get fuel for my older cars once new technology takes over? In the meantime, and despite the name of this blog, I’ll be keeping a very close eye on developments and the real-word impact of new cars as they appear. Exciting and interesting times to unfold ahead indeed. With the fact of the increase in electric vehicles it made me think if there is an increase in Personal contract hire on cars as it does appear so, Adverts everywhere and plenty of people driving around in new cars. Could this play a part in the future of the car, and how will the motorist change too.